My “close” range is a half hour away. My other range is just over an hour drive. That means it’s important that I have what I need to make sure I can enjoy my time there without worry of prematurely ending a session due to some unexpected gotcha. That’s why I carry some extra “less traditional” items in my range kit. I keep a roll of that white, cloth, athletic tape in my bag all the time. It’s excellent for both bio and mechanical failures. On the body repair side, it’s a great quick fix for developing blisters, whether on your trigger finger or feet. Trigger finger blisters? Really? Well, yes, it happens, especially with high-volume shooting of an unfamiliar gun. 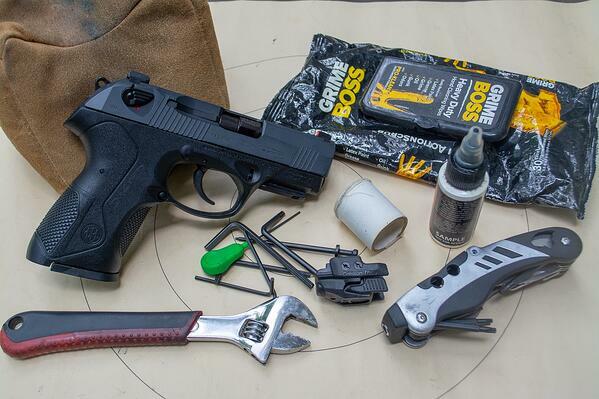 The combination of the trigger guard and recoil can quickly rub a raw spot onto your hand. That tape is also plenty sturdy and makes an excellent field repair tool. I’ve used it to “suture” torn sandbags, tape targets when I’ve run out of staples, and hold a broken grip panel on a handgun to name a few uses. In short, if it breaks, maybe tape can fix it. Duct tape is a decent alternative too; it’s just not as flexible for those "bio repairs." You can always take a cleaning kit to the range if you really want to, but that doesn’t sound like much fun, now does it? When I’m at the range, I’d much rather be shooting than cleaning! Anyway, that’s not what I’m talking about here. Keeping a small container of general purpose gun oil or CLP (Cleaner, Protectant, Lubricant) can save the day. Guns get dirty, and when used a lot, that dirt and grime can dry out and create, and here’s the technical term, crud. Sometimes that crud builds up to the point where malfunctions start happening. While not recommended by any factory anywhere (they’ll tell you to do a proper cleaning), you might keep your gun in the game with a shot of oil in the moving parts area. Yes, you should still clean your gun when you get home because that’s the proper fix, but if adding some lube will keep it running until then, it’s an easy and expedient solution. I carry a small (and light) collection of tools in my range bag. A multi-tool is a must, especially one that has a screwdriver (flat and Phillips), pliers, and a pin punch. Another handy addition is a collection of Allen and Torx wrenches. Many, many gun parts like grip screws, scope rings, and lasers use these types of wrenches for mounting and adjustment. Fortunately, they are small and light and add little weight or bulk to your range kit. A brass, segmented cleaning rod also comes in handy for stuck cases. While true squib loads, where the bullet gets stuck in the bore, are rare, it’s far more common for a cartridge to come apart during manual ejection, leaving the bullet stuck in the chamber. Being able to poke out cases or bore obstructions will keep you shooting. Tools made of brass aren’t going to cause damage to the harder steel parts on your gun. If you shoot rifles or carbines, an adjustable crescent wrench is also helpful for tightening those mounting nuts on scope or red dot sight bases. While ammo manufacturers are jumping on the bandwagon to produce primers that don’t use lead compounds, we’re not there yet, and ranges tend to have lots of environmental lead scattered about. For indoor range visits, you can usually wash your hands when finished shooting to reduce the risk of lead contamination. As for more rural outdoor ranges, it’s good to have a quick clean up option available. You can get filthy out there. I carry two types of hand wipes. Grime Boss makes fantastic general purpose hand and body disposable cleaning cloths. One side of the cloth is rough to get the dirt off while the other is smooth. You can get these in soft packs, so they’re light and don’t take up much space. The other type I carry is lead removal wipes. Through some VooDoo magic, these products (there are several brands) use ions, electronics, and flux capacitors to draw stubborn lead residue away from your skin. Apparently, regular wipes don’t do a great job removing lead from skin. Whether you shoot handguns or rifles, a simple sandbag rest can really come in handy. Are your shots impacting somewhere other than what you expect? Using a quick and dirty rest for your gun can quickly rule out shooter errors like flinching. So, if you think your sights are off, use a quick rest like this to make sure it’s not you. Pro-tip! To save lots of weight, fill this bag with rice or plastic beads. It’ll still offer flexibility and support, but it’s a heck of a lot easier to lug around. A small rail-mounted laser can be a great training tool. Perfect shot technique calls for you to hold your sights still before, during, and after the shot. Even when you’re using iron sights, you’ll see that dot dance all over the place on target if your hold and follow-through aren’t steady. If it’s too distracting, just have a friend watch the laser movement while you shoot. It’s easy to customize your own “necessities kit” over time. Every time you run into a glitch at the range that either stops your shooting or limits your effectiveness in some way, just think about what would have been nice to have to solve the problem.